Hi and welcome to this month’s Q&A session! Every month, I answer four of your piano-related questions as best as I can. Feel free to leave any other questions you might have in the comments, and perhaps I’ll answer them in the September episode. This is something that I never noticed until receiving a couple comments about it on this channel. I don’t recall it ever being brought to my attention by a teacher, either. Sometimes I see serious finger collapsing in children – not usually in adults – as if it’s virtually impossible for them to keep their fingers upright. It’s like they haven’t developed those muscles yet. In this case, as long as they’re always mindful of a good hand shape, the finger collapsing tends to resolve itself when they get a little older. However, after doing a bit of preliminary reading on this topic (and I’ll share a link with you guys on the blog post to a really good page explaining this), it seems like it’s probably desirable to correct this problem – but maybe not much of a big deal. I will say that any minor finger collapsing hasn’t caused me any overt issues this far into my piano playing life. But there’s always room for improvement, and I’m far from being a perfect piano player. I will also say that I watched some YouTube videos of famous performers to see how their fingers move when they play. As far as I can tell, Horowitz’s fingers collapse sometimes (I notice it in the shape of his third and fourth fingers), and I doubt he’s the only one (I’m pretty sure I notice it in Rubenstein too, and Yuja Wang’s pinkie finger). The best explanation of finger collapsing that I’ve read is this: If we get used to pressing the keys in the way where we “pull back” our fingers as we press, those knuckle joints tend to collapse. But if we press the keys with more of a forward diagonal motion, the fingers tend to regain their structure. This isn’t a super in-depth answer but I wanted to address your question. This is one of those things I really haven’t learned anything about, so I’ll have to look into it more. But it seems like the answer is yes, you probably want to avoid having your finger joints collapse when you play – especially if it happens all the time and/or you’re double-jointed. Do check out this informative blog post on the topic. This question is kind of a two-in-one – how to play legato, and how to make that legato have different tones. As far as I know, the meaning of legato playing is the same whether you’re playing Classical, Romantic or Modern music. The definition, in essence, is to keep the notes “smooth and connected”. When you’re playing Classical music, the most important thing with legato playing is that you pay attention to the places where legato is marked – and where it isn’t. Where the slurs are literally tells you where to hold, and where to lift. Piano students sometimes have the tendency to just play everything smooth and ignore any breaks in the slur, but you really want to obey them. Another thing you might want to think about when you’re playing legato is how to make that passage lifelike. If you have a nice long slur, it sounds somewhat robotic to play all of the notes in a flat line, with no variation. Good legato playing means that you not only want to play those notes smooth, but you also want to look for natural variances, or a “rise and fall”. That’s really the essence of legato playing – whether it be Classical, Romantic or otherwise. Keep the notes connected, observe the breaks in legato, and find some natural movement within the slurs. Now in terms of altering the tone of the notes (ie playing them brighter), this requires some subtle adjustments and a little trial and error. How you press the keys is going to alter their tone. So if you press into the keys rather heavily, your tone is going to be heavier. But if you keep your hand shape raised, play from your fingertips and press lightly, you’re going to have a lighter tone. Generally Classical music sounds best with this “lifted” sound – make sure your wrist is staying up (level with your hand), your fingers are relaxed, and you don’t lean into the notes too much. This is something you’ll really want to personally experiment with to figure out – the physical differences in playing are very subtle, but make a big difference when you play. I’m so glad you asked this question! This is something that comes up fairly often in my studio, and I haven’t really talked about it before. The answer is, don’t look down. When you’re playing, and your head is constantly going up, down, up, down, what’s going to happen is you’re going to lose your place in the music, or you’re going to have to pause. It’s disorienting. Ideally if you’re reading music, you really don’t want to look at your hands at all (a peek here and there is fine if you’re doing a large leap). 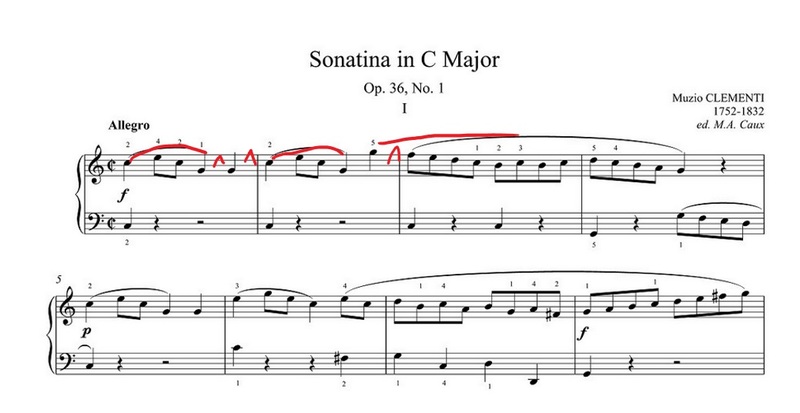 When I notice my students do this, I take a great big piano book and cover their view of their hands. Then I get them to play again, without being able to look at their fingers. The result is almost always better than before. They play with fewer pauses, and they don’t actually struggle with where their fingers should go. For distances up to an octave, you really don’t need to look at your hands at all. You should be able to “feel” those distances without looking – and if you can’t, that’s something to start working on. While relying on sight is obviously useful when playing an instrument, relying on tactile sensations is just as important (if not more so). Even if I’m playing something with large leaps, I try to train my tactile memory. Then I can use both my vision and tactile senses when executing that jump. If you’re playing something from memory, it’s fine to look at your hands. But if you’re reading sheet music and playing, try to minimize the amount of time you glance down – your playing will be better for it. We’ve talked about motivation a few times on this channel (webinar Inspiration Session, how to stay motivated when the going gets tough), and we’ll probably continue talking about it because it’s important, and it’s something that virtually everyone goes through. The reality is that most of us need to take breaks in our lessons from time to time – sometimes for short periods, sometimes for extended periods. And for most of us, it can be a challenge without that weekly motivation. First of all, I want to assure you that you won’t have to start at a lower grade level. I’ve basically never seen that happen (unless someone hasn’t played at all in like…10 years). Other piano teachers might balk at this suggestion, but you can ignore technique for a while and it’s not a big deal. If you’re bored of scales, don’t do them – try learning some etudes with scale passages instead. Etudes are great because you still build and develop your technique, but they’re much more fun to play because they’re actual pieces. For me, I always need a little structure, even if it’s self-imposed structure. I will generally make a rough outline of a year plan (I do the same thing with my students), and then pick some goals to accomplish in a shorter amount of time, like 3 months. Performance goals are probably the most motivating. Maybe you can prepare a set of pieces for a mini-concert for friends and family. Give yourself 3 months to prepare a certain amount of pieces (like 5 or 6), and plan a gathering. Or join a band or group, so that you can still play and are accountable to more than just yourself. There are good online communities for this, too – Piano World forum does regular online “recitals”, and many people publicly post their goals and videos of themselves playing. You might find that useful. Hopefully these suggestions get your brain-gears turning, and if you want to get into more depth, do check out the videos I mentioned earlier. Thanks for tuning in to this month’s Q&A session! I always enjoy doing these, and as I mentioned before, feel free to ask any piano-related question that might be plaguing you at the moment.